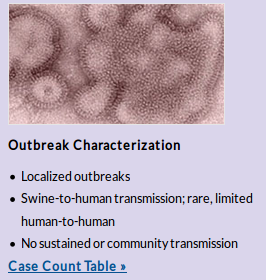 Although I wrote about the initial announcement yesterday morning (see CDC FluView: 4 H3N2v Cases Reported (2 in Michigan , 2 in Ohio), the CDC has released a lengthy statement and updated case charts (here, and here) on these four recent swine variant influenza infections. People who raise, or work with pigs are at greatest risk of infection, but County and State Fair animal exhibits also provide opportunities for these viruses to jump to humans. The CDC has a list of preventative actions you can take to protect yourself. August 12, 2016 – Four human infections with influenza viruses that normally circulate in swine (swine influenza) were reported by CDC this week. When swine influenza viruses are detected in people they are called “variant” viruses and are designated with a letter v at the end of the virus subtype. The four human infections were caused by H3N2v viruses in Ohio (2) and Michigan (2). All four patients reported attending fairs where they had exposure to pigs during the week preceding illness onset. Pigs at the fairs have reportedly tested positive for swine influenza A (H3N2) infection. The Ohio patients are not related other than both of them reporting having attended the same fair in Ohio. Similarly the Michigan cases both attended the same fair in Michigan, but are otherwise unrelated to each other. CDC is working with state public health officials to support their human health responses and has recommendations for the public on what steps they can take to help protect against H3N2v and other swine influenza viruses. CDC has information and guidance for local and state public health officials regarding the surveillance and investigation of human infections with H3N2v virus, and will share updated information if the situation changes. For now, and for the past few years, we've been in `watchful waiting' mode on these viruses. Except for 2012, when we saw more than 300 cases, most years we usually see only a half dozen or so reported. 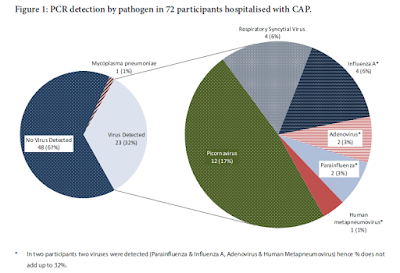 As long as they don't transmit efficiently among humans, then these swine variant viruses pose a very limited and relatively minor public health threat.